Home / News / Alright Devices CHRONOBLOB 2 dual digital delay back in stock! Alright Devices CHRONOBLOB 2 dual digital delay back in stock! We have a bunch of the wonderful CHRONOBLOB 2 back in stock – this is a Tempo Synced Stereo Digital Delay, featuring: Freeze/ Hold, Analogue Feedback Send & Return, Multiple Delay Modes. Chronoblob 2 is a digital delay module! Just like his little brother, Chronoblob 2 can sync to a clock signal. Patch one into the SYNC input and choose a multiplier or divider for rhythmic delays. Or leave SYNC unpatched for access to continuously variable delay times! 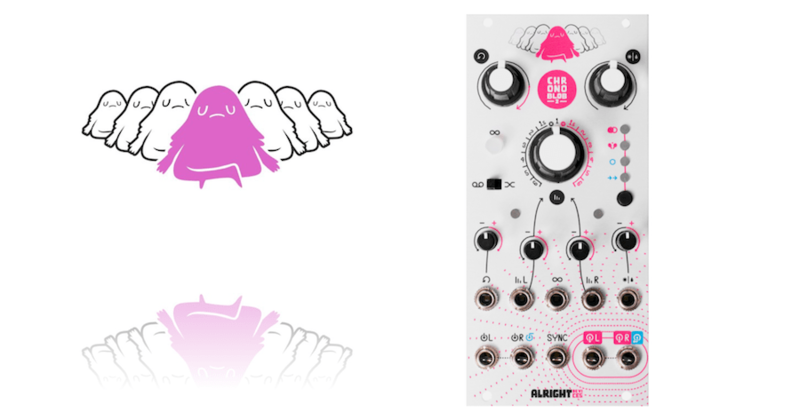 Chronoblob 2 offers four different delay modes! Dual delay mode provides two separate delays with shared controls. Ping-pong mode extends this intermingling even further by placing each delay in the feedback loop of the other. Single delay is the classic Chronoblob mode with feedback SEND and RETURN. Patch in a lowpass filter for smooth, shadowy echoes, or get weird with a wavefolder or any other effect! Cascade delay mode expands on this archetype by also placing the second delay inside the feedback loop of the main delay, creating a wild multiplying echo effect. Chronoblob 2 provides control voltage inputs for TIME, FEEDBACK, and DRY/WET, and bipolar attenuators for each so you can dial in just the right amount of control. In Dual and Ping-pong delay modes, although both delay times are controlled by the main TIME knob, you can voltage-control each independently with the two TIME CV inputs. The right TIME CV is normalled to the left one so you can easily control both with the same signal. Additionally, the left TIME CV is normalled to five volts, allowing you to use the attenuators as offsets from the position of the main TIME knob. Also in these ‘pink’ modes, the right audio input is normalled to the left input, and the right audio output is normally mixed into the left output (patching into the right jack breaks this connection). Like the original Chronoblob, you can select the style of time modulation with the slide switch. Choose tape mode for sweeping pitchbend effects, or fade mode for smoother, cleaner changes. Chronoblob 2 offers an INFINITE LOOP button and gate input to shut off the delay inputs and lock the feedback at 100%.